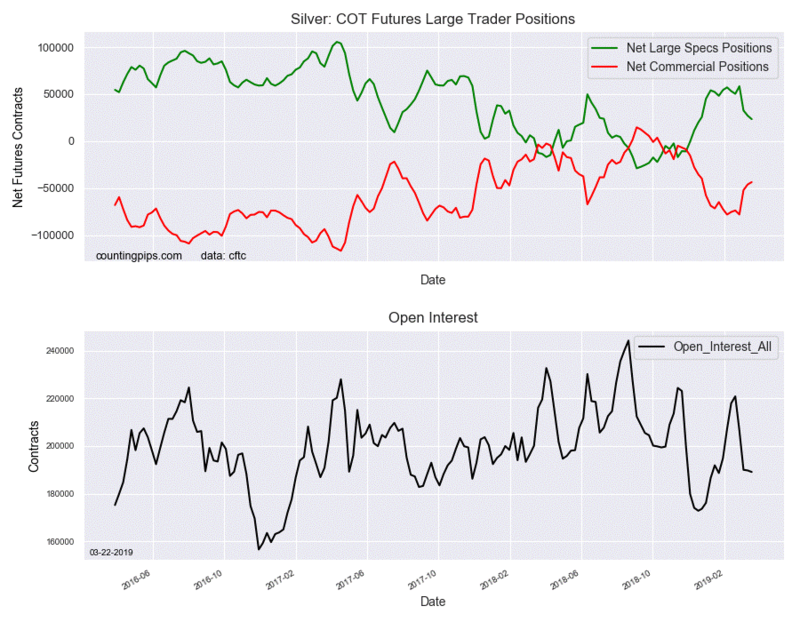 Large precious metals speculators reduced their bullish net positions in the Silver futures markets again this week, according to the latest Commitment of Traders (COT) data released by the Commodity Futures Trading Commission (CFTC) on Friday. 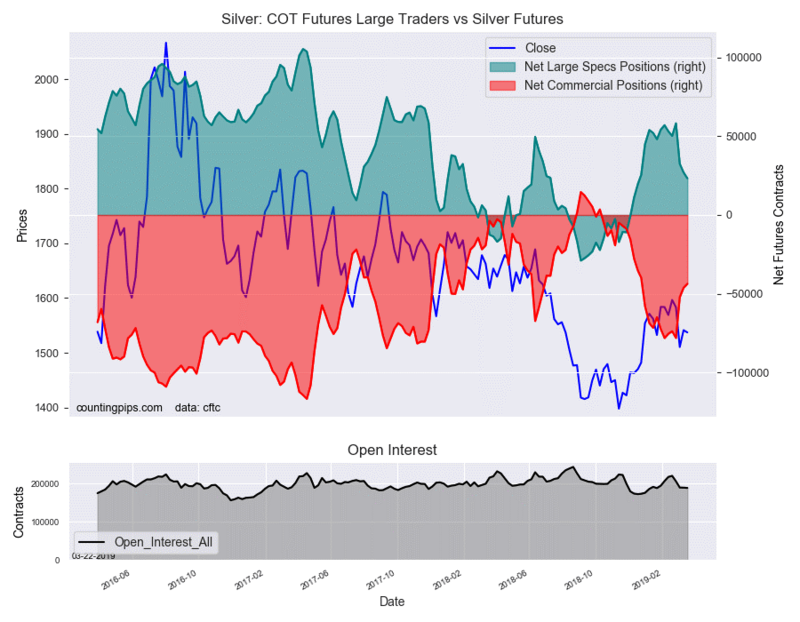 The non-commercial futures contracts of Silver futures, traded by large speculators and hedge funds, totaled a net position of 23,310 contracts in the data reported through Tuesday, March 19th. This was a weekly lowering of -3,772 net contracts from the previous week which had a total of 27,082 net contracts. The week’s net position was the result of the gross bullish position (longs) decreasing by -987 contracts to a weekly total of 75,196 contracts that combined with the gross bearish position (shorts) which saw a rise by 2,785 contracts for the week to a total of 51,886 contracts. Speculator net positions have dipped for three straight weeks and are now down by -35,003 contracts over that period. The speculative position, with strong gains in January and February, streaked to its best level since November 2017 with bullish bets above +58,000 contracts on February 26th. The recent cool off in positions has brought the current standing to the lowest level in the past twelve weeks. The commercial traders' position, hedgers or traders engaged in buying and selling for business purposes, totaled a net position of -43,700 contracts on the week. This was a weekly increase of 2,561 contracts from the total net of -46,261 contracts reported the previous week. Over the same weekly reporting time-frame, from Tuesday to Tuesday, the Silver Futures (Front Month) closed at approximately $1537.20 which was a loss of $-4.10 from the previous close of $1541.30, according to unofficial market data.